The Probability of Failure on Demand indicates the likelihood that a system does not perform the required safety function. For instance, the likelihood that a SIL-3 system does not shut down a process when required to is better than one in thousand or 0.1%. In other words, the availability of the safety function is better than 99.9%. Alternatively, it may help to think of a reduction in risk by a factor 1,000. It is important to distinguish between the required SIL level and the realised SIL level. A required SIL level follows from an assessment of risks and hazards, for instance using a HAZOP or an FMEA. The required SIL level is determined independently for every safety function or safeguarding loop. Important considerations are the probability of a risk occurring and the impact of the risk, i.e. the severity. A Risk Assessment Matrix often proves useful when determining the desired SIL level of each safeguarding loop. 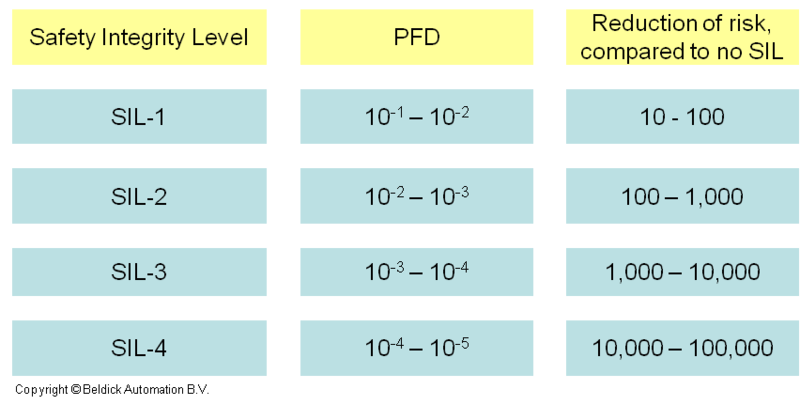 For each of the above components a Probability of Failure on Demand is required, after which the overall PFD for the loop, and the realised SIL level, can be calculated. We are experienced in performing these calculations and assessing the PFD of legacy (“brownfield”).